← Raspberry Crumble Bars. Songs About Liars And Lying. 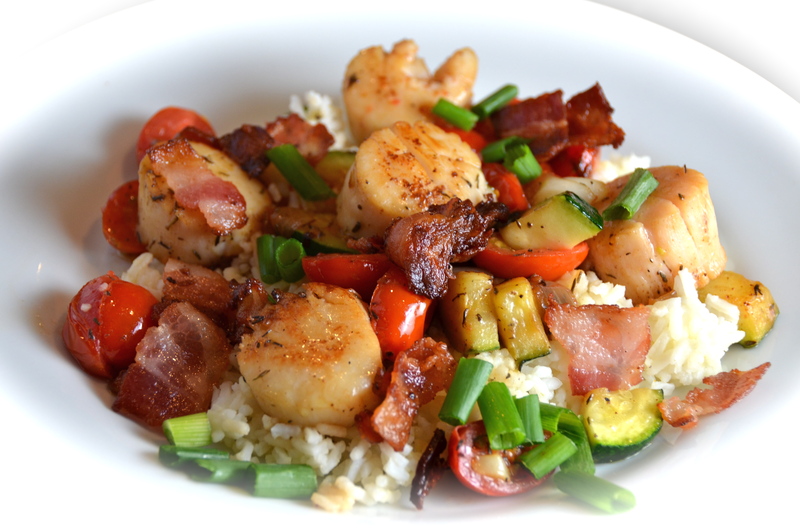 Unwrapped Bacon Scallops. Listening To Alex Winston. Did you ever have those little bacon wrapped scallop appetizers? This meal has the same flavors, with the addition of some vegetables and rice. And no wrapping involved. Looks just as good as it tastes. 1. In an ungreased 1-1/2-quart microwave-safe dish, combine rice and broth. Cover and microwave on high for 7-8 minutes or until liquid is absorbed and rice is tender. Let stand for 5 minutes. 2. Meanwhile, in a large skillet, cook bacon over medium heat until crisp; remove to paper towels. Drain, reserving 1 tablespoon drippings. 3. Sauté the onion, zucchini and garlic in drippings until tender. 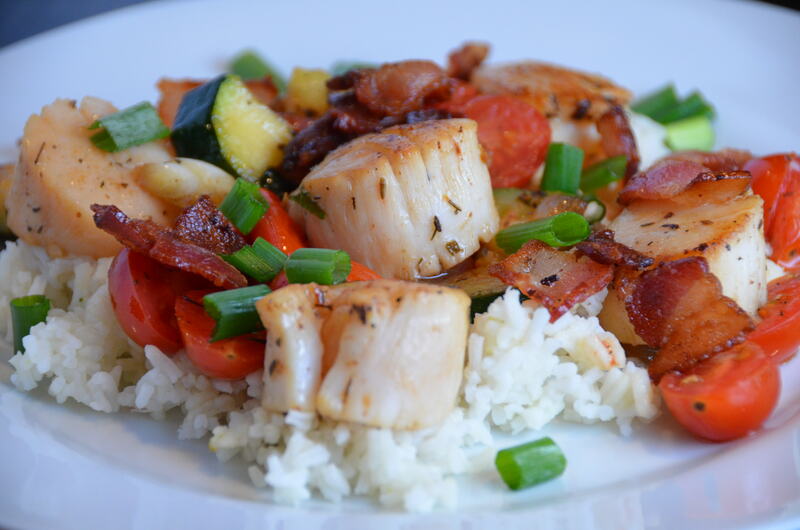 Add scallops; sauté for 3 minutes. 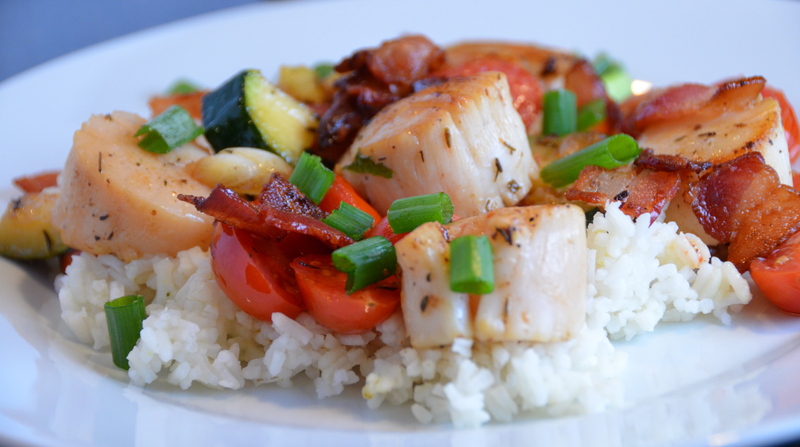 Add the tomatoes and thyme; sauté 1-2 minutes longer or until scallops are firm and opaque. 4. Fluff rice with a fork and spoon the scallop mixture over the rice. Sprinkle with green onions and bacon. I find this song really intriguing, I guess because I don’t really get it. Polygamy? This is a remixed version, that I quite like. The video (original song version) is interesting, too. Check out Alex Winston on her Website, where you can also buy the music. This entry was posted in Seafood. Bookmark the permalink. 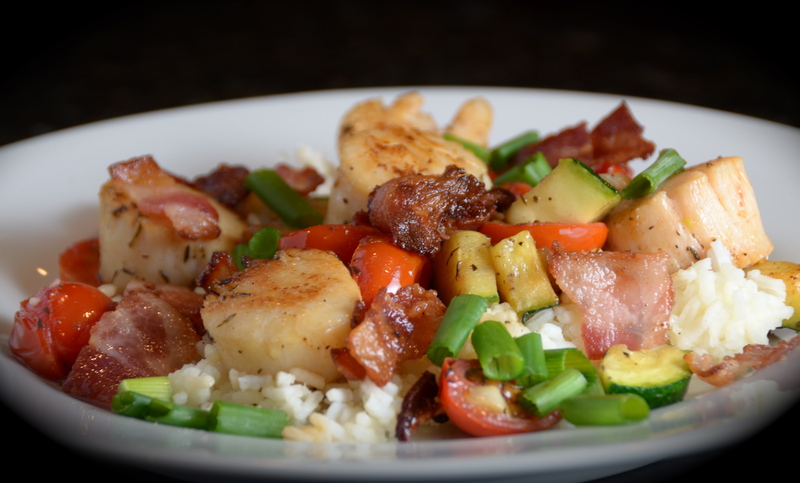 4 Responses to Unwrapped Bacon Scallops. Listening To Alex Winston. This looks delicious! Can’t wait to try!